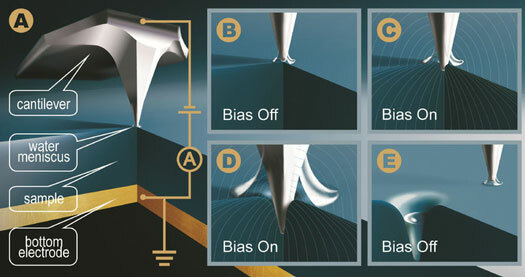 (Nanowerk News) Friction impacts motion, hence the need to control friction forces. Currently, this is accomplished by mechanistic means or lubrication, but experiments conducted by researchers at the Department of Energy's Oak Ridge National Laboratory have uncovered a way of controlling friction on ionic surfaces at the nanoscale using electrical stimulation and ambient water vapor. The research, which demonstrates a new physical effect, was undertaken at the Center for Nanophase Materials Sciences, a DOE Office of Science User Facility at ORNL, and is published in the journal Scientific Reports ("Nanoscale Lubrication of Ionic Surfaces Controlled via a Strong Electric Field"). "Our finding can have a significant technological impact on applications for both macroscopic and nanoscale devices," said lead author Evgheni Strelcov. "Decreasing or increasing nanoscale friction at will and thus controlling mechanical energy losses and wear of a microelectromechanical system's parts has enormous implications for applied energy research and opens a new vista for fundamental science studies." By inducing a strong electric field using an atomic force microscope, the researchers were able to both increase and decrease friction between a moving nanoscale electrode and an ionic surface. They argue that the primary effect responsible for this behavior is condensation of moisture from the surrounding air into liquid that can then reduce friction. Simultaneously, further strengthening the electric field results in the nanoscale electrode penetrating the surface and an increase of friction. This penetration is a new and unexpected effect, and the overall approach differs from other methods of friction control that often require adding a lubricant to the system instead of drawing on resources readily available in the immediate environment. Additionally, unlike other electrochemical friction control practices, the new technique does not require an electrical current, which is associated with energy losses. "Absence of current is highly beneficial from a power-saving perspective as it eliminates Joule heating and other parasitic power-consuming effects," says Bobby Sumpter, who led the group developing associated theoretical models. "We adopted this biased view on the nanoscale almost a decade ago," said contributing author Sergei Kalinin. "Now we can proceed from observation to control of even such sublime phenomena as friction, and it is indeed very surprising and promising that we can both increase and decrease it."